Are you are dreaming of an exotic beach wedding on a secluded beach with a brilliant sunset in the background? Then you must be dreaming of a Bahamas Destination wedding. As the Bahamas has more beach than almost any place else in the world so you are sure to find a beach that has just the romantic appeal for your wedding on the beach. So here are some helpful tips for planning a Bahamas Destination wedding on the beach. The most difficult decision for you maybe deciding on the island for your wedding. While most persons are familiar with Nassau and Paradise Island there are more than 700 islands and cays in the Bahamas with more than 5,000 miles of pristine powdery sand beaches. And even in the Bahamas all beaches are not the same as there are beaches with white sand and there are beaches with pink sand. There are beaches with tens of beach goers and there are beaches with only you and seagulls. There are beaches with large resorts as the backdrop and there are beaches with only the sun light blue skies. So the choice is really up to you. And that choice is dependent on how much money you are willing to spend on your wedding. If you choose to have your wedding during the peak tourist season then you can expect to pay a little more for airfare, hotel accommodations and wedding arrangements. So it is very important that you not only consider your own pocketbook but the pocketbook of the persons that you would like to share your wedding with you. And you also want to extend the courtesy of letting them know of the wedding date as soon as it is set. So that they will have the time needed to make their attendance at your wedding possible. Another reason why you want to give your family and friends as much notice as possible is that you will need a passport to reenter the United State after the wedding is over. So they may need to get a passport if they do not already have one or renew any expired ones. And this can take some time. 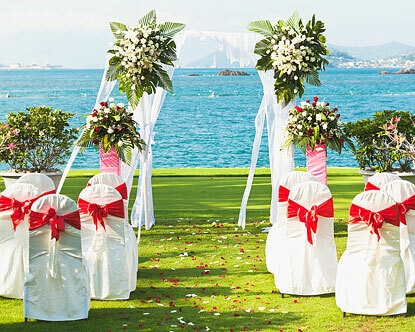 Once you have decided on the island and time then you want to contact a wedding planner to help you with the planning. You will find that having the help of local expertise will help you get rid of a lot of the stress of planning a destination wedding. And with all other arrangements that you may need for your wedding. While providing you with helpful advice and guidance. Finally, deciding what to pack for the trip to the Bahamas. While a Bahamas destination beach wedding allows you flexibility in what you wear it also allows you flexibility in what to pack for the trip. And you can decide to pack as much or as little as you like. In fact you can even decide to rent your wedding dress and outfits for your wedding. Giving you the freedom to really enjoy a stress free time while celebrating your love on a romantic beach in paradise.